Christopher Manzione's artwork pop to life. In line at the grocery store, at the table in a café, or out on the city streets you see people of every age peering into smartphones or tablets. Whenever there is a free moment we are increasingly driving our consciousness away from our surroundings and into the non-space of the internet. Artist Christopher Manzione takes this common scene and expands on it. In his solo exhibition at the Center for Contemporary Art, Sacramento, All Surfaces Become One, Manzione pulls the viewer into the physical realm through the a smartphone or tablet only to bounce them back out to the virtual with the use of augmented reality software, and 3D printed objects. Entering the space we are confronted with a series of dark and abstract prints that give very little visual clue as to their source or meaning. However, after installing the free app (available for both Android and iOS) the artworks pop to life. Hosted in the digital images, the sculptural apparitions seem to reach into space through the window of a phone. After the initial novelty subsides we can begin to discern specific objects within the floating sculptures. One of the most apparent is a banana peel in Compound Host. Created by making 3D scans of everyday objects within his studio, the images have a sense of haphazard still life. Like a photograph these are past moments, but through augmented reality we perceive their physicality. We anticipate the decay of the giant egg shells, or lemon rind even though they are frozen in non-corporeal form. This sensation is made even more apparent when viewing the untitled sculptures that accompany the exhibition. Manufactured by 3D printing, the sculptural objects are physical manifestations of the same 3D models that inform the augmented reality prints. Seemingly monochromatic, the artworks are tucked into a corner in the back gallery illuminated by spotlight. The lighting highlights the materiality of the objects, with moments of translucence and pearlescent shimmer. Like the prints in the West Gallery, these artworks take a moment to decipher. By translating the still life from the studio into the gallery space through 3D printing information is lost. In one particular piece we can latch onto the familiar form of the banana peel but as a crystalized echo, frozen. The sensation is that the still life's that informed the work were flayed, leaving behind a delicate skeleton. 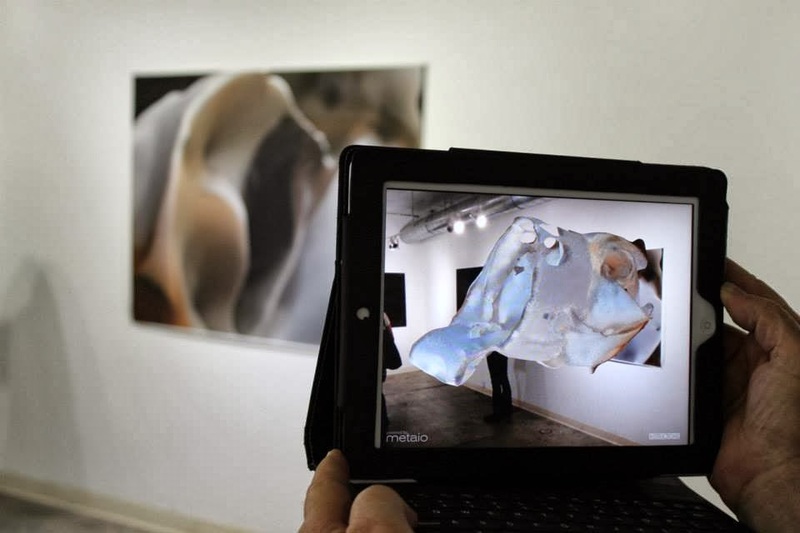 In the same space as the 3D prints is All Surfaces Become One, a single channel video. If the untitled sculptures were flayed, then this is where their hides are kept. Undulating and intermixing the skins float in the ethereal non-space, waiting for their chance to manifest themselves. Examining the exhibition as a whole it becomes apparent that all of the artwork could be downloaded and printed anywhere with the appropriate technology. The real question Manzione poses to us is, here does the artwork exist? At times it floats intangibly before us, other times it manifests form, yet these are only echoes of the moments in the studio. Much in the same way, our daily interaction with each other takes different forms as it is mediated by technology.